Patagonia is defined by its commitment to quality and to the environment. To place an order please complete the online application you can find on this page. If you have any questions, please contact corporate sales at 800-470-7458. You will receive all pricing information after your application has been reviewed and accepted. You must have a current account to submit a Patagonia Purchase Order, and all orders are subject to approval and availability. Opening orders must be 50 units or more. All orders must be 10+ units. Discounts reflective of order size. For each order, we require disclosure of company whose name will appear on the Patagonia product and how product will be sold. We reserve the right to refuse service. 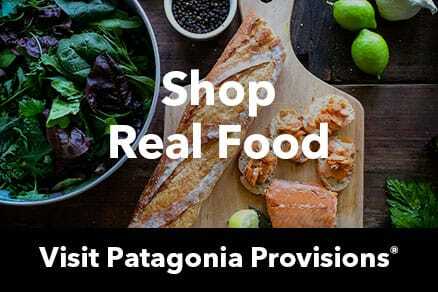 Patagonia gear purchased through our Corporate and Group division cannot be resold directly to consumers for any reason. The products shown in this catalog are available for bulk purchase. If there are other Patagonia products you’re interested in, please call for availability. Samples can be returned within 90 days of your order for a refund. Patagonia is required to charge sales tax for all orders in the U.S. If your company is reselling the product and has a reseller’s license, a copy must be emailed or faxed with the order. We accept checks, Visa, MasterCard, American Express and Discover. Credit terms are available for applicants who qualify. Please contact your Corporate Sales representative for a credit application. Our standard shipping method is UPS Ground. Two-day and overnight shipping options are available for an additional charge. Shipping charges will be calculated and added to your order invoice. Patagonia guarantees every product we make. Returns not related to quality are accepted for 30 days with a 15% restocking fee. No returns are accepted past 30 days from date of invoice. All returns and exchanges must be preauthorized by a Patagonia Corporate Sales representative. Please call for a return authorization (RA) number. The RA number must be prominently displayed on the outside of all return shipping boxes. Synchilla® fleece, Regulator® insulation and Capilene® fabrics, like most synthetics, will melt or burn if exposed to flame or direct heat. They are not flame-resistant. Do not use them near any direct source of heat or flame. If you are not satisfied with one of our products at the time you receive it, or if one of our products does not perform to your satisfaction, return it to Patagonia for a repair, replacement or refund. Damage due to wear and tear will be repaired at a reasonable charge. Please call Customer Service at 800-470-7458 for a return authorization. Embroidered, screen-printed or altered products are eligible for warranty service as long as the product defect is not the result of such embroidery, screen-printing or alteration. The issuance of credit or replacement product for any product shall be at the sole discretion of Patagonia.